but there are some varieties that are perennial or biennial as well. with the exception of the dry desert areas of the Southwest. growing in your butterfly garden. Rudbeckia hirta is also commonly known as a Gloriosa Daisy. 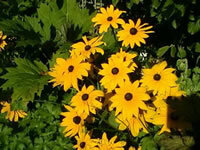 Black Eyed Susan plants are hardy in USDA zones 3-10. Rudbeckias are very adaptable to almost any type soil, but should be grown in full sun and watered regularly to achieve the best flowering performance. Deadheading spent flowers will prolong the blooming period considerably. 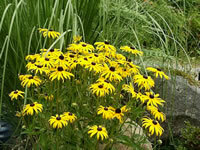 Perennial varieties of Rudbeckia can be propagated by division during their dormant season. or started indoors 6-8 weeks before planting them outdoors in the Spring. Rudbeckia seeds require light to germinate, so only lightly press them into the soil surface without covering them up.